Image Wings: Are they aliens too? The Three Muses challenged us to show that there is PLENTY MORE IN THE SEA! According to these crazy devotes of Ancient Aliens everything that is clever, ingenious or complex from our pre-history to nowadays was made/created/commanded by aliens or at least by some hybrids half-alien half-human. In this sense, probably mermaids, mermen and other magical creatures are also aliens, why not? 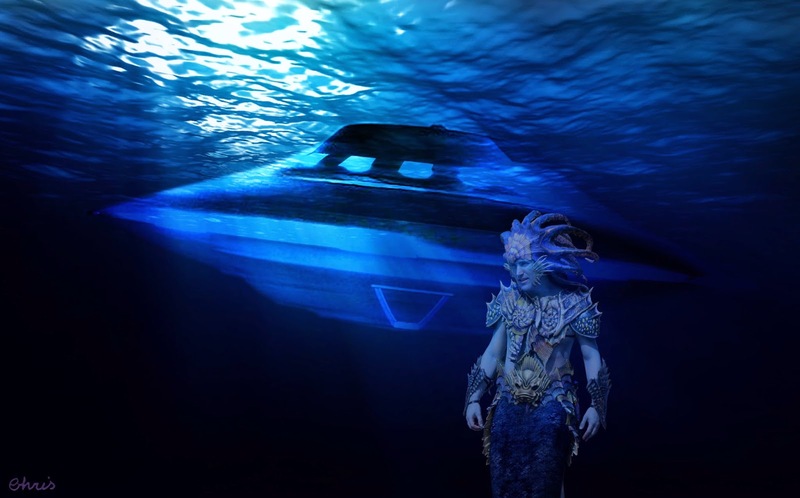 Background and overlay are free wallpapers; UFO is a hybrid of images I've already had; merman came from a screenshot of the movie Empires of The Deep (which failed even before its release). Really cool, Christine! Love that seaman! Interesting ancient creatur indeed. Unique art piece, Christine. This is a wonderful underworld fantasy, Chris. Great mystery! Wow! So unique and beautifully presented. so really cool! unique idea! Wow this look so real great idea and wonderful execution. Very strong image and powerful idea Chris! They all smell so fishy so I wouldn't be surprised if they are aliens! Hee hee, love this Miss Chris. My goodness! 50 shades of creepiness and mystery!! This is fabulous, Chris. I looooooooooove your artwork. Super creepy and super well done!